Pakistan is Swedish Nat'l Junior Ch stallion of 1995. 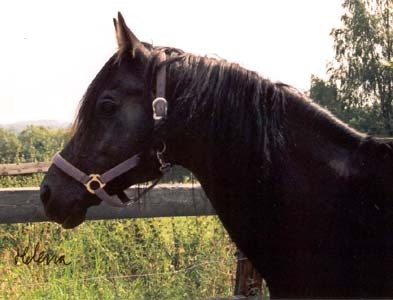 His daughter Eloutzica was Reserve Junior Champion mare at the Blommeröd Show in 1997. He is a son of the Etat son Flak and a grandson of *Probat through his mother Prolarna. Prolarna comes from the family of Grobla from the Uhlén family. Gwiazda Polarna, grandmother of Pakistan, was in fact inbred to Grobla being by a Grobla son out of a Grobla daughter. Pakistan belongs to the dam line of Milordka, belived to be a Saklawi line imported to Slawuta in 1810. This family is large and has produced many outstanding horses. The Milordka family has three major branches, that of Anielka 1909, that of Siglavi-Bagdady 1908 and that of Koalicja 1918. Pakistan belongs to the branch of Siglavi-Bagdady. This branch is probably the most important, with individuals like Fetysz, Saga, Canaria (with another line to the Milordka family through Koalicja's son Enwer Bey), Gwara, Cosmosa, Estokada, Celebes, Eskapada, *Elkana and Ekstaza. This branch was introduced to Sweden with the mares Sakla and her daughter *Sake, Canaria and her daughter Cantata, and Grobla, imp in 1965. Grobla was a daughter of *Gwadiana who was a supreme dam of champions. Horses descending from *Gwadiana are: stallions Gdansk, Cognac, Gwar, Gwalior, Gwydion and Strike and mares: *Gdynia, *Gwozdawa, Garnet, Gardenia and Gwyndalyn. Grobla is a granddaughter of Gwara (Wielki Szlem x Canaria). More recent importations from this branch are Epopeja (Palas x Eskapada), Esterka (El Paso x *Estera) and Efemeryda (*Eukaliptus x Emigracja), granddam of Ezysta. Grobla produced 11 offspring, of which all has been used for breeding! The stallions *Grojor by *Exelsjor, Gryf by *Essaul and Granit exp UK by Nimbusz and the mares *Antoniaa, *Gromnica, *Granatowa, Gustawa (all by *Essaul), *Gwarancja and Gratulacja by *Espartero, Gracja by Algier and Gawotka by Nimbusz. *Gromnica is the greatgranddam of Pakistan and also dam of Galaxcja by *Aladdinn, the dam of Glaz. Gwiazda Polarna (*Grojor x *Gromnica) was bred to *Probat and produced Prolarna.